Here are today’s best Spurs articles. For many, summer league basketball brings little interest, especially if you aren’t a lottery team getting a first glimpse of your draft pick, hoping you’ve struck gold with the next franchise player who will resurrect your team. This is often the case for Spurs fans, when the most interesting aspect is usually finding out if the first round draft pick or an old stash has a chance to get minutes under Coach Gregg Popovich. 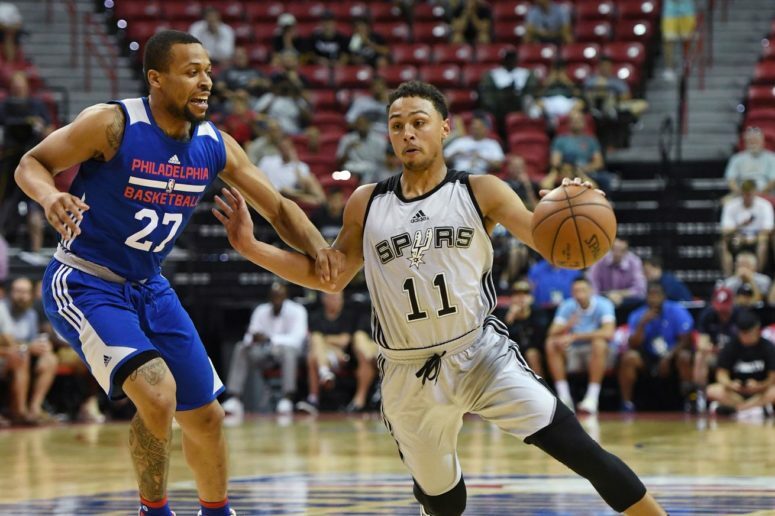 This typical dullness also serves a purpose: it makes those times when a player like Bryn Forbes, underdog story and all, comes along and blows your mind all the more special. Shea Serrano over at The Ringer has a list of what all it takes for an otherwise little-known player like Forbes to steal the show and win over the hearts of bored basketball fans. Very few injuries can have a worse impact on a player’s career than a torn Achilles tendon. It’s a long road to recovery, and few ever return to their previous form. The Spurs’ biggest acquisition of the off-season, Rudy Gay, aims to buck that trend as he finds new basketball life in the Alamo City after four “mentally draining” years with the Sacramento Kings. Physically in shape and ready to go, Gay feels he has all the motivation he needs to come all the way back and help the Spurs content again. The Spurs latest pickup in free agency is Brandon Paul, a former University of Illinois shooting guard who spent the last few years overseas before impressing the Spurs enough for a guaranteed contract while playing for the Magic and Cavs in summer league. Our friends over at The Champaign Room, the SB Nation site for the Fighting Illini, went over what Paul brings to the table and sees him possibly carving out a Gary Neal type role with the Spurs (minus the attitude issues that plagued him once he left). Dewayne Dedmon recently signed a two year, $14 mil contract with the Atlanta Hawks. The athletic big man was the latest example of the Spurs finding a diamond-in-the-rough at the bottom of the free agency pool and turning him into a desirable piece for almost any team. Although Dedmon fell out of the rotation towards the end of the season when his level of play dipped and the Spurs chose to go small, he is still grateful for the time spent with the organization that helped set his career path. Go get paid, big fella. You earned it. What’s Big Fun been up to lately? It been over a year since Tim Duncan officially retired from the NBA, but that doesn’t mean he hasn’t been busy. From fun times like traveling Chile with Fabricio Oberto and picking on Sean Elliott during broadcasts, to fulfilling fatherly duties and taking a crooked accountant off the streets, it’s tough to tell if life has actually slowed down or not for the busy father of three. Happy retirement, Timmy! Of course, what better way to leave off than with some Timmy D highlights?